On Tuesday, LeBron James stated that he will end up being one of the top four basketball players ever. His current Mount Rushmore of the NBA is Michael Jordan, Larry Bird, Magic Johnson, and Oscar Robertson. These statements have led ESPN and other majors sports networks to create their own Mount Rushmore’s. Instead of following that pattern, I introduce the Anti Rushmore. These players represent the worst basketball players to ever step on the courts. Darko Milicic- The 2003 NBA Draft was filled with some of the biggest stars in the league today. LeBron, Carmelo Anthony, and Dwayne Wade were all taken within the first five picks of this draft. Then there was Darko Milicic. The 7’0 Serbian was taken 2nd overall by the Detroit Pistons. The next three picks; Carmelo Anthony, Chris Bosh, and Dwayne Wade. In his 10 year career, Milicic average 6 point and 4 rebounds a game. He will forever live in the infamy of one of the worst draft picks ever. Adam Morrison- It’s sad when your most memorable moment is crying, post game, in college. That moment perfectly represents Morrisons entire career. Taken third overall in 2007 draft by the Bobcats, the Gonzaga product was the definition of a bad player. Despite winning two championships as a waterboy for the Los Angeles Lakers, in his two seasons with significant playing time, Morrison averaged 8 points and 2 rebounds per game. He never shot over 40 percent from the field and looked absolutely atrocious on defense. His “career” is something worth crying over. Luke Walton- Unfortunately, the only thing he got from his dad was his last name. the son of Hall Of Fame center Bill Walton, Luke’s career was filled with nothing but bloopers. Walton was arrogant, annoying, and a above all else terrible. Despite playing significant minutes for a decent portion of his career, the 2nd round pick from Arizona averaged double digit scoring only once in his entire career. Mercifully he retired in 2013. 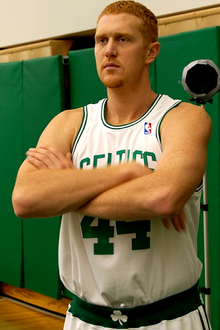 Brian Scalabrine- I’m not going to even think about insulting “The Red Mamba.” With that being said, Scalabrine is by the far the worst basketball player ever to step foot on a court. He has gained cult status for his time spent on the bench during games. This ended up proving useful, as he is now an assistant coach for the Golden State Warriors. Think we missed someone? Who would you have put on the anti Rushmore? Let us know in the comments!